MakerBot and Home Depot announced a new partnership on Monday to bring 3D printing capabilities to the masses. Several models of 3D printers will be sold in select stores and on Home Depot's Web site, and MakerBot kiosks will be available in a dozen Home Depots in nine cities to demonstrate how the technology works. "This is a step towards bringing MakerBot 3D Printers to the mainstream," MakerBot spokesperson Jenifer Howard told CBS News in an email. "Home Depot customers are DIY'ers, gardeners, tradesmen, professionals and families -- they are also a great community that likes to create and build things, which goes very well with 3D printing." This is not the first time MakerBot has ventured into retail stores. The company has three locations of its own in New York, Boston and Greenwich, Connecticut. The company's 3D printers are also available in Microsoft stores and MicroCenter retail stores -- totaling about 70 locations across the U.S. The company has sold more than 44,000 MakerBots, CEO Bre Pettis said at the 2014 Consumer Electronics Show. MakerBot hopes that by making the technology available at Home Depot, it can introduce more consumers to 3D printing by demonstrating production of various objects, such as replacement parts, product prototypes and collectable items. "Imagine a world where you can 3D print replacement parts and use 3D printing as an integral	part of design and building work," Pettis said in a press release. Home Depot is offering several of MakerBot's latest models, including the Replicator Mini 3D printer, the Replicator 2-Desktop 3D printer, Replicator Desktop 3D printer and the Digitizer Desktop 3D scanner. The store also sell several types of filaments for the printers. On Home Depot's Web site, the printers range in price from $1,375 to $2,899. 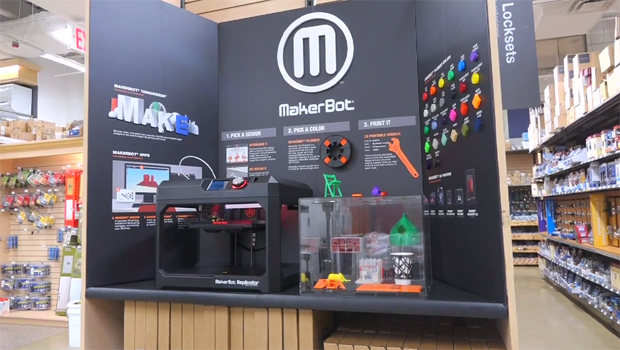 Although trained staff will be demonstrating the company's 3D printers in Home Depot kiosks, the MakerBot 3D ecosystem is accessible to anyone, with files, designs, software and apps made available on the company's website, Thingiverse.com. The printers can also be purchased through the MakerBot Web site.